Crude oil kicks off Thursday’s Asian session relatively on the front foot amid fresh optimism over the US-China trade talks that boosted the appetite towards the higher-yielding oil while the US stocks also managed to close into the green. The risk-on sentiment offset the recent bearish API crude stockpiles data, leaving the black gold somewhat underpinned. US Crude inventories increased 6.6 million barrels, compared with analysts’ expectations for a decrease of 42,000 barrels. On the other hand, markets digest the latest reports of potential US sanctions on Venezuela’s Crude oil exports, which could make the oil markets tighter, with the OPEC output cuts already underway. Traders now look forward to the release of the EIA crude stockpiles data due later today at for fresh trading impetus. Crude prices continued to decline during Wednesday's session after failing to break above the $53.26 resistance level to close down by nearly 1%. The price is still managing to hold above the $52.28 support level, however, bulls are facing a decent pressure from the bears which can be shown by the long tailed candles. 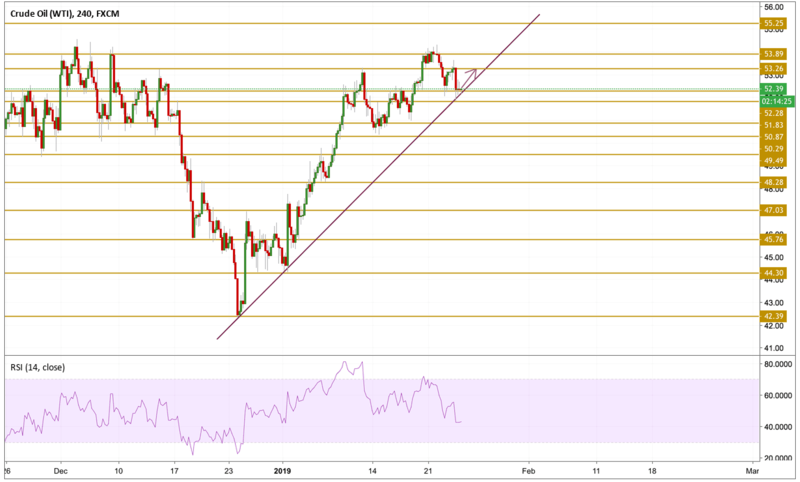 The price is currently well supported by the trend line presented on the chart and the $52 level and we expect a retest of the $53.26 levels that will be a a challenge for the bulls to win.